I recently changed my black iPhone to white. I found a vendor on eBay that sold all the pieces as a kit for $75. That was a lot better then $199 at the Apple store with another 2 year contract! It was a bit of a commitment getting this done, but with the right tools and patience it can be done by a “regular” tinkerer like me. My process took about 1.5 hours in all, but I was going really slow and cataloging everything with pictures. Here’s the process in a few pics. All the parts can be seen above. I have already taken off the back as that’s super easy. Two screws on the bottom and you just slide it up and pop it off. The magnetic tray I got from an auto parts store. It was invaluable to keep the tiny screws from disappearing. I heard that the battery was easy to take out…NOT! It was secured with adhesive and I had to pull very hard and firmly to get it to finally lift out. 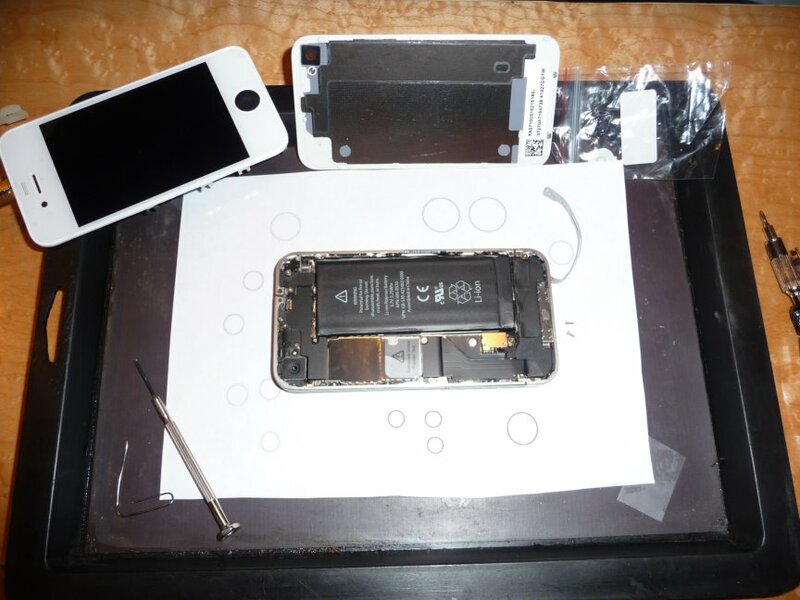 The picture above shows the battery being lifted out. There are 5 connectors at the top near the camera. You can see the little screws are in their respective circles. Also in this picture you can see the vibrating device just outside the top edge of the phone. 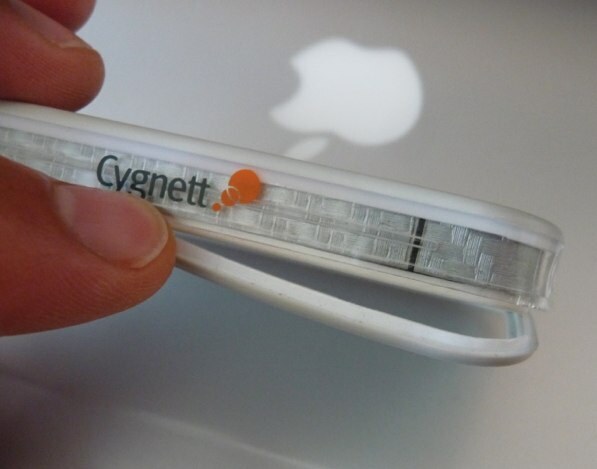 It’s pretty cool how it’s contacts are connected. There’s basically a copper plated spring steel “prong” coming off of it. Screwing it in place forces the prongs to contact the power source. I thought it was a nice way to accomplish a connection with no wires. Main board is being removed. Speaker box at right. 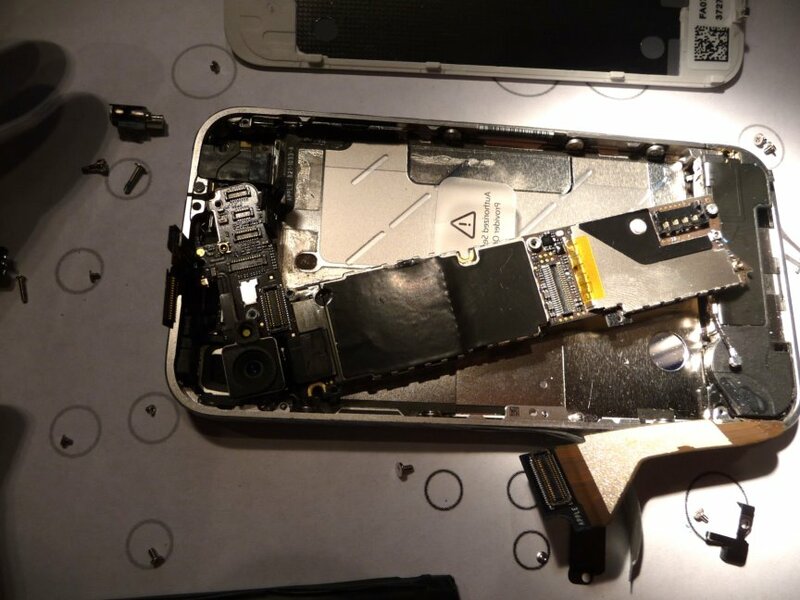 After all the connectors are out, you can lift the main board out of the phone. In this picture you can also see at the far right, the plastic box that holds the speaker and causes it to amplify the volume. The audio cable is a teeny tiny black wire with a unique circular connector. I was really fascinated by the various fasteners. 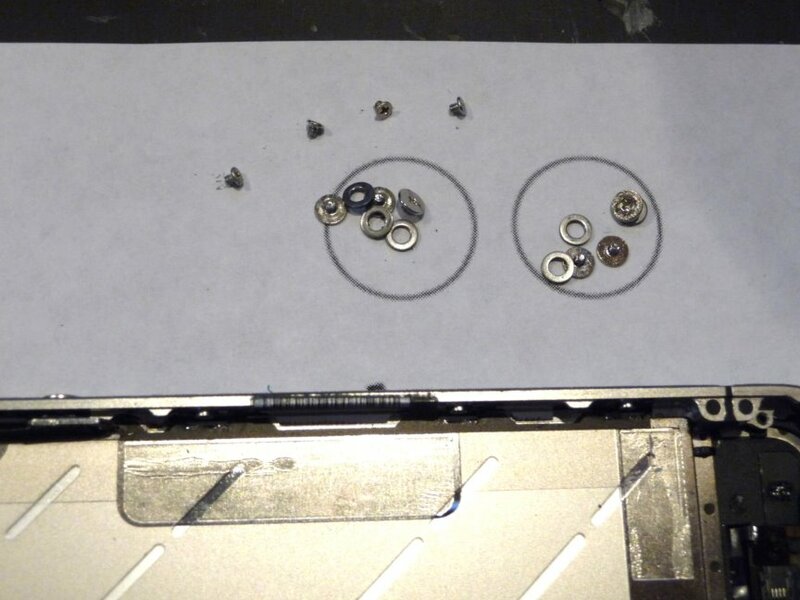 The touchscreen and LCD assembly is held by these 10 screws. It’s hard to understand the scale of those top screws without actually trying to handle them. I had to break out tweezers for this step. 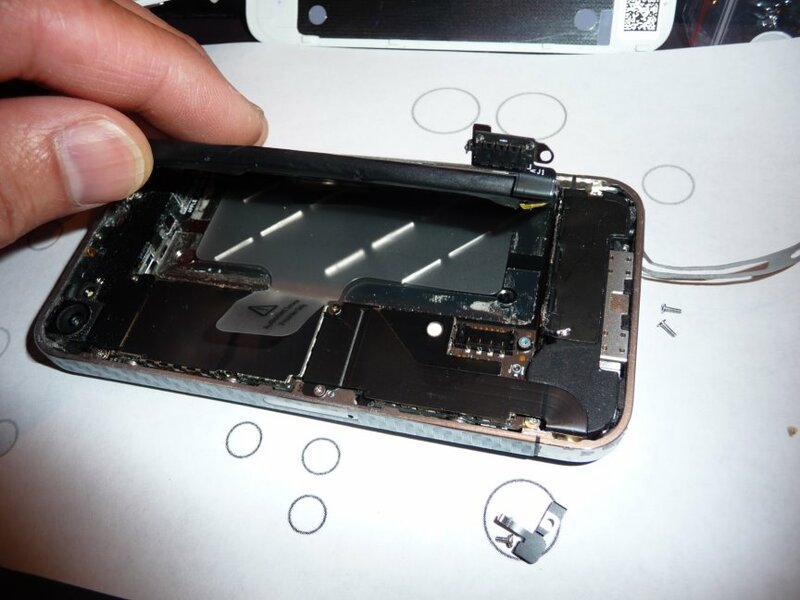 Those 10 screws hold the touchscreen and LDC assembly to the phone frame. Separating the screen was the most nerve wracking part. I had to pry quite a bit to get the glass separated from the frame. You see, there’s an adhesive involved. I ended up using a swiss army knife blade to cut and pry until it came loose. I was afraid I was going to crack the glass, but I didn’t. Again they don’t tell you that there’s adhesive securing the plastic button to a rather delicate mylar film with contact stripes on it! So once again I broke out the swiss army knife and ever so carefully pried the button away from the mylar, all the while hoping that I didn’t damage the contact stripes. It proceeded VERY carefully as there was no replacement for this. If this button didn’t work, I would be royally screwed. Luckily it all went well. So that was the last major setback. After that, I just had to re-assembly everything in the right order. The tolerances are extremely tight in the phone. They did not waste an lot of space. So a few tips, get really really small screwdrivers. I just needed a Philips and a flathead. The magnetic tray was key! It kept all those tiny screws from getting lost. It also kept them pretty close to the circles on the paper I was working on . The circles are roughly equal to the locations on the phone interior. Finally, if something doesn’t fit just perfect, stop and check clearances and how the parts are seated. Everything fits in a very precise manner. If something looks bents or is not flush to the surface next to it, it’s probably not right. Take it apart and check it again. OK, that’s my experience that I wanted to share with you. If you decide to go for it, good luck and take your time! So when the first iPhone came out, I got the first one available. It was black. 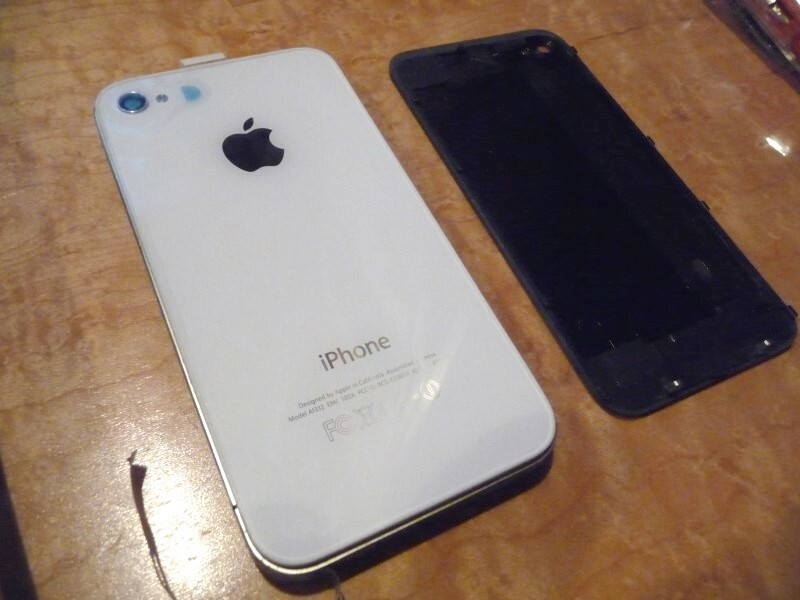 When a white come came out, I “upgraded” and got a 3GS. It actually had a faster radio and more memory so it really was an upgrade. Fast forward and the iPhone4 is introduced in black and white. I wanted a white one, but they were not available. Once again I got a black one. Now history repeats itself. 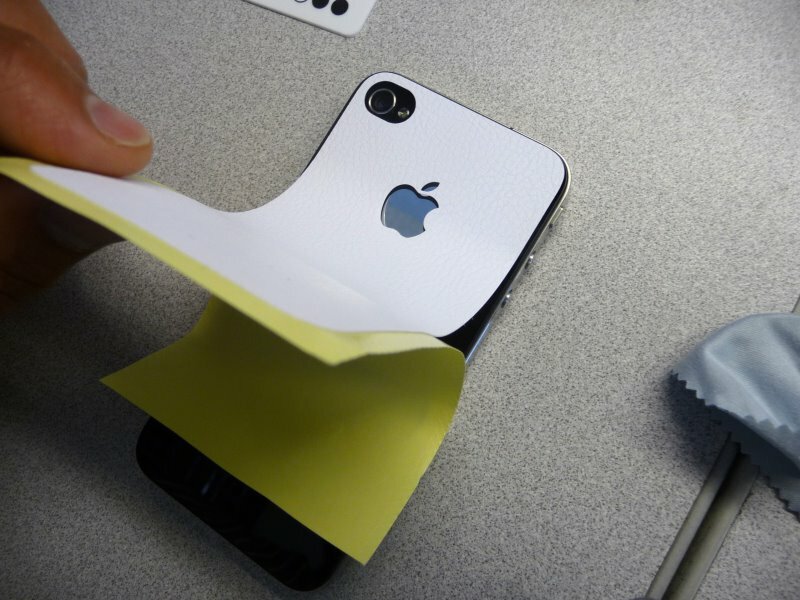 The white iPhones are introduced last month and there are already rumors of an iPhone 5 in the works. What’s a guy to do? I like the white, but I don’t want to get the same phone and pay a ridiculous premium just for a color. Hmm, perhaps there’s another way. 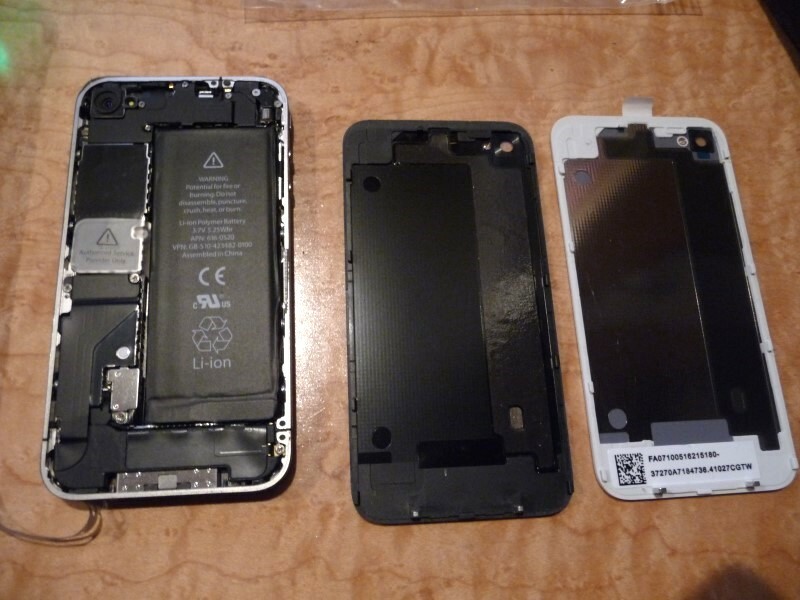 So I figured that replacement parts for the white phone must be available now since it’s officially introduced. Did a quick search and … bingo! Not only that, I came across this awesome video on how to do the face swap. http://www.iphoneshopusa.com/. Now if you know me, I am a tinkerer so I ain’t afraid of nothing, even it means breaking the device. I thought I’d start “easy” and do the back first. I ordered a white back from an eBay seller and thought I’d give it a go. It arrived quickly and upon inspection, it looked like a really good quality piece. It really was OEM as stated. Sometimes you can’t be so sure on eBay. Taking the back off was simple – two screws and a push. 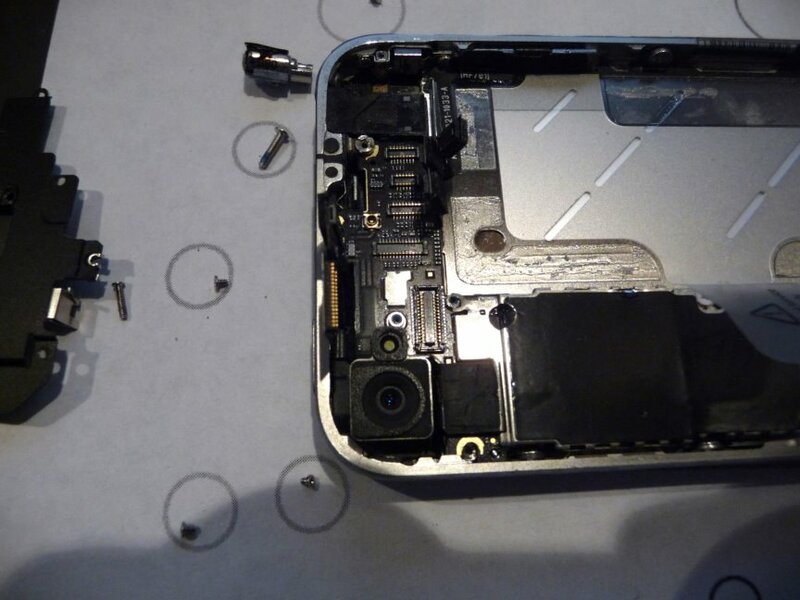 With back off, I can also see the inside of the phone. Getting the new back on was simplicity itself. 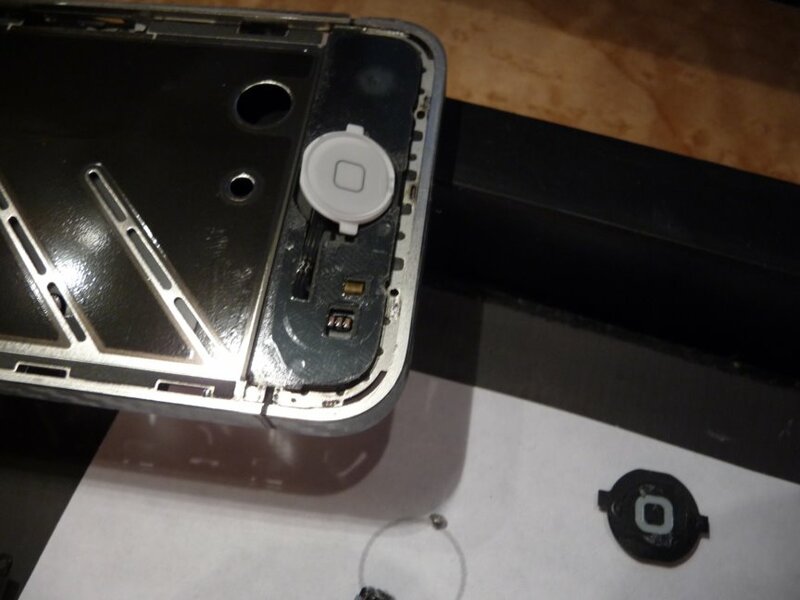 Plop on the new back (be sure and take off the plastic protectors) slide it back into place and replace the screws. Really, that’s it. The new back looks as slick as I had hoped. As you can see, I now have a white iPhone back. So far it has been a week and I still love it. The quality is great and people think I got a “new” phone. Now the giveaway is the front. It’s still black. This is where it gets tricky. You see, the front cannot be replaced so easy. If you viewed the video on the website I mentioned earlier, you’ll see that the front is a bit more of a commitment. 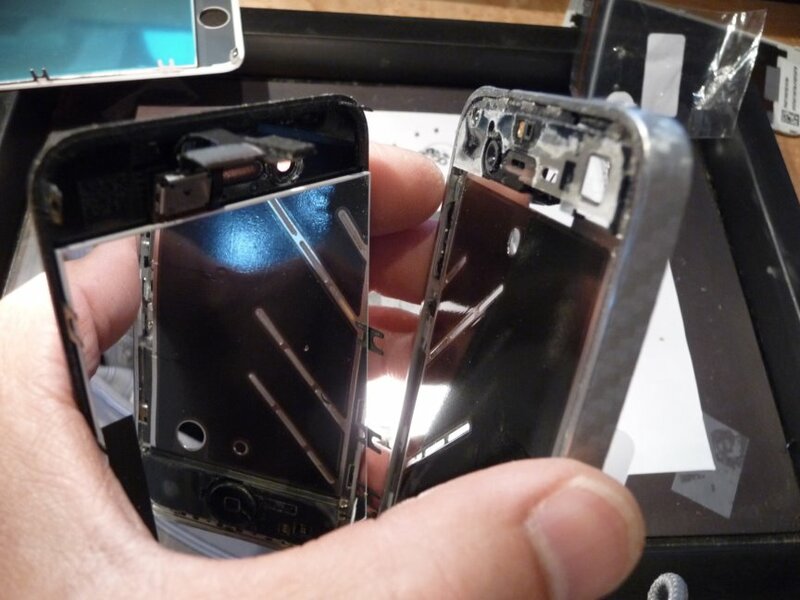 Also, the part isn’t so cheap as you will be replacing the entire touch screen and the LCD panel. The best deals I can find are around $80-100. It’s still cheaper than a new white iPhone. I’m still thinking about it, but it’s just a matter of time. I’ll probably bite the bullet and do it. In the end, I have managed to get most of my white iPhone satisfaction and I won’t have spent more than the cost of a few cases. 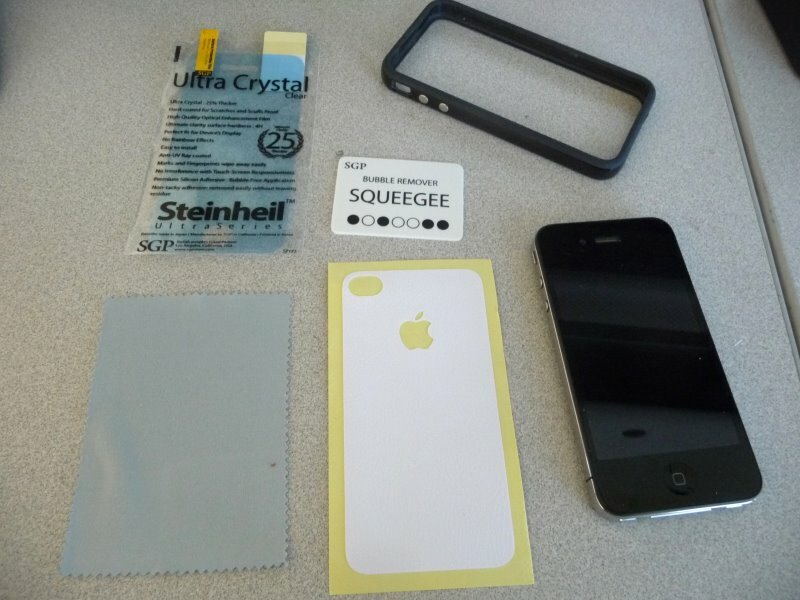 I’ll also have some spare black iPhone parts for sale. So I finally broke down and got an iPhone4. It’s a really nice unit, but I lost all my nice un-Apple approved applications. Somehow, I’ve found that I really didn’t need all those extra items. I’ve been able to find replacements for most items except for the hotspot application. However, a new problem arises. It’s time for a case. Yeah, after all the time and money that I have spent on cases for my 3GS, I find myself starting over again. So what to get? There were a few criteria. One – I didn’t want a huge aberration of a case that spoiled the nice design. Two – I really wanted a white iPhone, but its been reported that they are not going to be out for a while. What’s a guy to do. For the first item, I decided to take advantage of the free case program from Apple. Most of the free cases my friends got were the huge aberrations that I mentioned above. They just about doubled the thickness of the phone. The cleanest thing I could find was the bumper case from Apple. A very nicely made and ridiculously overpriced piece of plastic. However, this was going to be free, so I went for it. The downside? The bumper case doesn’t protect the front or back glass. I’d need something else for that. Then I came across a curious thing. You may recall that I got a nice “Leather” look skin for my laptop. 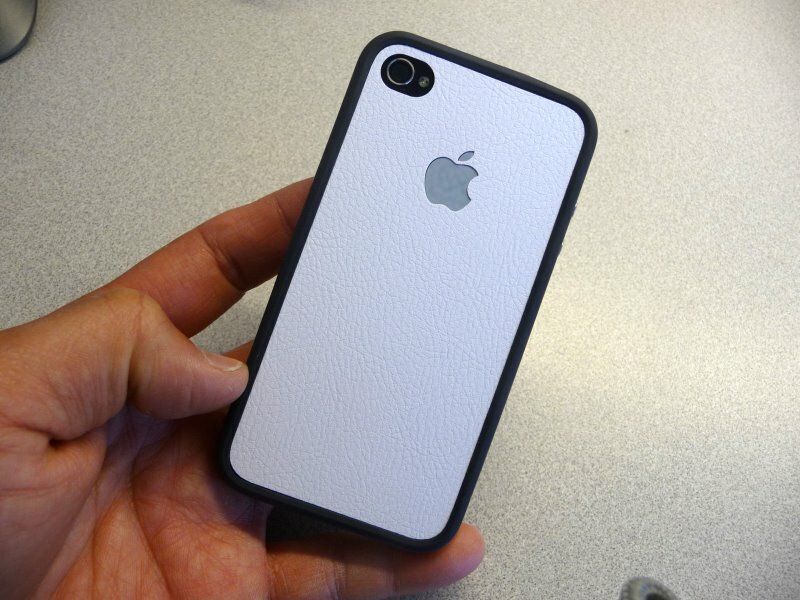 Well, the same folks made skins for the iPhone4. They even had one in white! Yea, you know where this is going. Easy to put on. Leaves no residue. Look, I have a white iPhone4 - sorta. So there you have it. I have a white iPhone4 now. It only cost me $17.99 + shipping. I am sure as time goes by, my case obsession will run rampant again. For now, this combination is good and it has already saved me 2 times as I dropped my phone. Let’s see how long it takes before I see something cooler.